In its first two seasons, Mad Men featured a grand speech in its season finale that summed up much of what had come before. In the first season, it was Don’s pitch to the Kodak people, and in the second, it was Peggy telling Pete that she could have had him, but she didn’t. Neither of these speeches directly spoke to the themes of the season, but if you looked at the subtext, they danced around those themes skillfully enough to feel like culminations of both plot and theme. They closed off major questions in the seasons in a character sense, but they also felt like ellipses placed after important ideas the season had put forth. These questions remain open, the show seemed to say, but here’s an answer for now. After the season three and four finales, which didn’t really feature this device, I figured Matt Weiner had mostly shelved it, for fear of getting too predictable. And much as I liked the idea of one character taking the time to sum up what we had all just been through, I can’t say that I don’t agree with him. There definitely would have been a point where the whole device would have crossed over from literary and poignant to having the feeling of the South Park kids pontificating about what they’ve learned today at the end of every episode of that show. Yet here we were about two-thirds of the way through “The Phantom,” and Weiner—who scripted the episode with Jonathan Igla and directed it as well—brought the device back, with not just one character but two discussing point-blank one of the season’s most important themes: that no matter what you try to find to fill the hole at the center of your life, it’s not going to be enough. First, Megan’s mother suggested that her chasing after her acting dreams amounted to her chasing a “phantom,” because not everybody gets to have their fondest hopes and dreams. Then, Pete Campbell goes to see Beth Dawes in the mental ward of the hospital. She’s just gotten done having electroshock therapy, both for her depression and to suit her husband’s monstrous whims, and she doesn’t even recognize him. He launches into a tale of a “friend,” who is a stand-in for him, a friend who thought he might find happiness with the wife of another man but soon found that everything he thinks will make him happy is just a “temporary bandage over a permanent wound.” It’s a haunting image, calling back to that empty elevator shaft in “Lady Lazarus,” and it’s a powerful moment in an episode that feels a little center-less at times. But it also underlines why I’m having a few niggling issues with this great season of television as it comes to a close. To me, Mad Men has always been at its best when it’s a series about mystique. It’s a show about the image of the perfect American man and the perfect American family that invites you to project your own thoughts onto that image, then proceeds to show you how empty the image is. It’s a show about how anything you want won’t be enough to fill the void at your center, but it’s also a show about how there are very high-paid men and women who are out there trying to convince you the thing that will make that void go away is just up the road a piece. 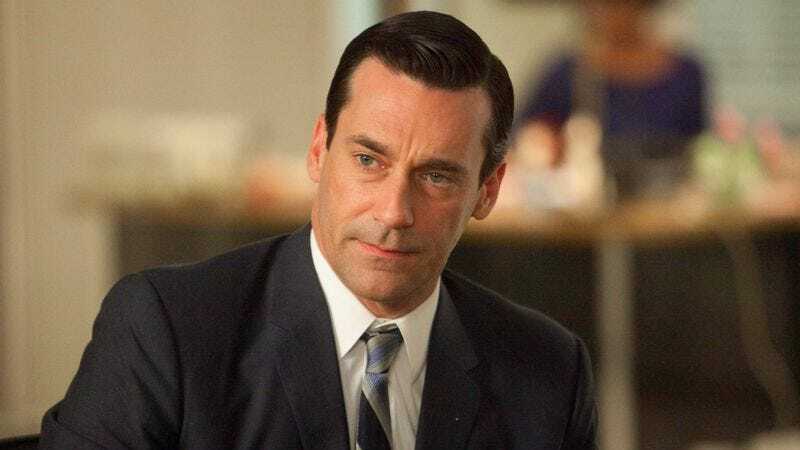 In its fifth season, however, Mad Men went out of its way to make nearly all of its themes explicit, then underlined them five or six additional times, just to make sure we were paying attention. Sometimes, this worked marvelously—the four episode stretch of “Signal 30” through “Lady Lazarus” may be my favorite stretch of episodes in the show’s history. Sometimes, this worked by the skin of its teeth— as seen in “The Other Woman.” Sometimes, it didn’t really work at all—like whatever was going on with Glen in last week’s episode. To some degree, the amount of thematic underlining is attributable to the times the show is now set in, upfront, brassy times if ever there were upfront, brassy times. But without the mystique, everything feels just a bit more hollow. Some of what hampers “The Phantom” is, surprisingly, Weiner’s direction. He’s done such a fine job with all of the previous finales—even nailing the tricky tone of “Shut The Door. Have A Seat”—that I’m surprised at how weirdly flat this episode feels, confined by lots and lots of unimaginative shots and brusque directing that might have been standard on any TV drama. 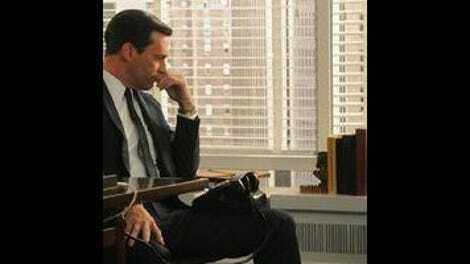 The pacing is all off in the first half of the episode, as everything jumps between storylines somewhat haphazardly, and though Weiner comes up with one magnificent image toward the end—the five partners of Sterling Cooper Draper Pryce in their new office space, looking out toward what’s to come—so much of the rest of the episode feels like it’s trying to fit three or four episodes’ worth of plots into one hour and just barely pulling it off. He gets solid performances out of some players who’ve struggled this season—particularly Alexis Bledel—and the moment toward the end with Don walking away from the commercial set aims for the iconic and mostly nails it. Yet there’s still that sense that this is biting off more than it can chew. This is too bad because the episode’s core is so very, very good. At the center is that idea both Marie and Pete espouse: A dream of something more is a very, very spoiled thing to have. If every little girl in the world got her fondest wish, Marie says, there would be a lot more ballerinas. For some people to get their dreams, a lot of other people have to fail. That’s just the way it is. So much of the season has been built on these characters’ striving—and on us wanting to see them succeed—that it’s easy to forget that for everybody clawing their way to the top, there are lots of other people down below them, be they the African Americans agitating for civil rights in the première or Lane Pryce just trying to find a way forward in last week’s episode. Don says to Megan that she doesn’t want to get her big break because she’s somebody’s wife. She wants to get her big break because she’s right for the part. But that’s not true at all. She just wants that big break, and if Don’s the one to get it for her, so be it. Yet something about setting her on this path—about helping her attain her dream—turns Don against Megan, just a little bit more. Soon, he’s back at the bar, talking to that pretty girl and smiling in a way where you know just what he’s going to say. It’s little moments like that—moments when you know exactly why this character is behaving how he is, yet the show doesn’t feel the need to spell it out for you—that make this show so powerful when it’s on its game. I don’t think I’ve seen a TV show as good as Mad Men at the slow accumulation of character detail. It’s excellent at suggesting the many possible versions of these people, then slowly letting us realize which version is turning up to any given scene. (It’s particularly good at this with its central two characters.) To watch this show is to feel such a rush when you realize where it’s going, or when it so thoroughly surprises you with a character shift or with a moment like Don and Peggy meeting in the movie theater, the protégé and the mentor finally on an equal level. These moments work so exquisitely that the show doesn’t really need all the underlining and thematic anvils, even when they work. This has always been a show in love with over-obvious symbols, but this season—and especially in these last two episodes—it often felt like they moved in to become another credited cast member. Or maybe this is just the natural outgrowth of the show getting older, of us having seen so many permutations of these characters that we can even recognize that what Don was up to with Megan this season must have been what he went through with Betty at one time. Maybe the mystery is no longer for us in the audience but for the characters, who step right up to the edge of understanding the terrifying hollow at the center of all things, but then go right back to chasing something to fill the void. Mad Men shares a lot of DNA with The Sopranos, and I’m reminded here of how in that show’s final season, Tony Soprano briefly tried to be a better man, then found himself sucked back down into his old ways. “I get it!” he shouted to the sky after having an epiphany only he was privy to. Don might as well be shouting the same thing when he turns his back on that film set, walking back into his old life. Earlier in the episode, Lane Pryce’s widow tells him that he had no right to fill a man like Lane with ambition, and it seems like another moment where the show is underlining one of its points, but it works because Don doesn’t get it. He’s never going to get it. And the only way for him to process any of this is to retreat into what he was, away from what he could have been. The “phantom” of the episode’s title is referred to by Marie as a dream that can never be attained. She’s trying to be harsh with her daughter about what she’s actually capable of, and she seems to be mostly behind the idea of Don nursing Megan through a failure, then turning her into the perfect little housewife he desires. But instead of simply doing that, some part of Don recoils. Some part of him really does want Megan to get what she wants. So he sits in the conference room at SCDP and watches her acting reel, cigarette smoke he’s not supposed to be inhaling wafting in the light from the projector. What he sees doesn’t suggest one way or another whether Megan’s a good or bad actress. There’s no sound. It’s just her smiling a lot, trying to look natural on camera. He watches and watches—and at some point, he gets her the job. She, too, is a phantom, someone who could be either of two possibilities: someone who just needs her husband’s help to get a leg up or someone who’s so terrible she shouldn’t get a leg up in the first place. Don doesn’t know. We don’t know. I was very heartened to see Peggy again in this episode, even if she didn’t really have anything to do. I’m reassured that she’ll be a part of the show going forward (even as I never really thought she would leave forever). If nothing else, Matt Weiner created a season that featured lots and lots of people hitting Pete Campbell in the face, and I think we can all thank him for that. The Beth stuff continues to be so marred by the fact that Alexis Bledel is the actress performing the part, and even if I liked a few of her line readings tonight, she was such a flat presence that the show created a situation where I was pretty sure it was setting her up to be seriously depressed in her early outing (and was proved to be right), but I can’t fault any of you who just didn’t think that was the case, because Bledel sold everything as generalized malaise. I liked Stan’s curt dismissal of his partnership with Ginsberg. Those two are really center-less without Megan or Peggy. No appearance from Betty, Sally, or Henry Francis, which is too bad. I always enjoy checking in on that crew to see how their adventures are thematically paralleling Don Draper’s in the season finale. Another thing this season was amazing at: giving us moments where Roger got to be hilarious in one line, then sort of melancholy in the next. His whole scene with Marie where he asked her to drop LSD with him was terrific. I feel like I’ve never talked about Harry in these reviews, because his role is always to be the complete and utter goober. And yet there he is, goobering it up again. Way to go, Harry! It’s been such a pleasure talking about this show with you folks. You’re always pushing me to try harder and look around different corners, and I always enjoy reading your thoughts. I look forward to seeing you for season six, hopefully in early 2013.